I cannot stop eating these scones. Nor can Zak or his coworkers. They are That Good. These scones were born out of a crazy birthday gift of an All Bacon Themed dinner. Every food served during the meal included bacon … even dessert! (The dessert will not be featured on VintageAmanda however as it was a bit of a caramelly disaster, but hey, I tried!). These scones were the accompaniment to the starter salad with bacon-wrapped dates. These scones are so good that I had to make another batch the following weekend, just because. In a bowl, stir together flour, baking powder, salt/pepper, cheese and bacon. Now pour in the egg, milk, yogurt and butter. Stir until JUST incorporated. With scones, you want to mix them as little as possible to keep them nice and tender. Overmixing = hard scones which is not good. So incorporate in the wet ingredients, and then turn out onto a floured board and shape into a circle using your hands. Slice the circle into 8 wedges. Brush each wedge with milk and sprinkle pepper on top. Bake for 15 minutes until golden brown on top and cooked through. I forgot to add, it says to preheat oven to 200c… converted that makes 392f… Which seems odd for a baking heat? Thanks! This recipe looks amazing! Can you convert it into U.S. measurements as well? I was doing some conversions of my own but I want to make sure I am measuring correctly. Amanda, since I was born in England it was always my secret shame that I had never made scones. Well – not really – but I’m glad you have remedied that situation. These were delicious! 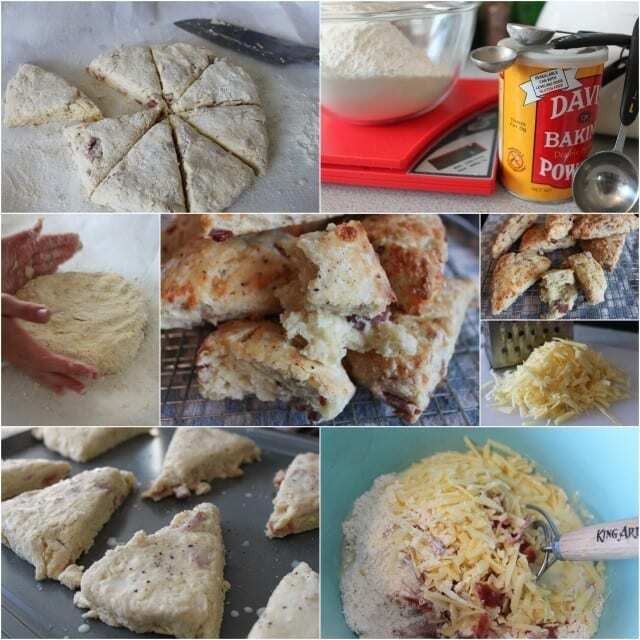 Do you have any other recommendations for scone variations? Hi Katherine, glad I was able to inspire you to reconnect with your British roots 🙂 Oh wow, I’ve done lots of kinds of scones – most have been sweet though. I made a pumpkin cranberry one in the Fall that was tasty (using dried cranberries). The classic plain ones are really nice too served with butter and jam (or clotted cream, if you’re in the UK!). On the savory side, I think you could try different cheeses, like blue cheese and walnut, or parmesan and herbs. The dough is really versatile once you know how to make a plain one, you can let your imagination go. Let me know if you try any interesting variations, I could put them on the blog! Hi Lee, cooked! I just updated the recipe. I cook the bacon till really crispy and then either cut it into little strips (for bigger bacony bites) or crumble it … depends on the texture you want and how crisp your bacon is! If you make them, let me know how they turn out. Hi there, do you use cooked bacon or raw? ?